As a kitchen and bath designer I get asked this question very often. Of course with the economy in the state that it has been these last few years everyone is trying to make every dollar stretch as far as they can. Surprisingly enough, working with a designer can actually save you money and get you the biggest bang for your buck…but that is another topic all together…I digress. So, what is Re-facing? 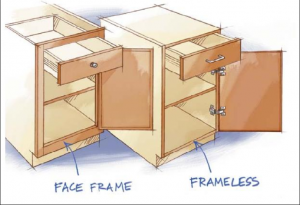 Re-facing is when you choose to keep the existing cabinet boxes and replace the doors, drawer fronts, and change the exterior appearance of the cabinet box. You want to make sure that the cabinet boxes are in good structural condition. 1. You don’t have to remove your countertops. 2. You don’t have to remove your backsplash. 3. Less demolition required, usually your kitchen is still pretty functional through the process. 4. No plumbing or electrical involved. There are some really great advantages to Re-facing cabinetry. What you might notice is that I did not mention cost savings as an advantage, and that is because each project is different. Frameless cabinets are much easier to reface because there is less cabinet surface that needs to be refinished by either applying a veneer over top of the existing finish or brining in a cabinet finisher to refinish those areas. If you have Face-Frame cabinets it is much more labor intensive process to Re-face so in the end what you might have saved in material cost you end up paying out in labor to refinish the existing cabinet exterior. 1. You can’t change the layout of the cabinetry. 2. The changes are only cosmetic not structural. 3. Old interior of the cabinets remain in place. The best advice I can give on whether or not you should consider Re-facing for yourself is what you are trying to achieve with your project and what type of cabinets you have. If you have face-frame cabinets and plan on replacing the countertops and backsplash anyways, you are probably dealing with the same cost for Re-facing versus replacing with a cost effective line of cabinetry. If you have frameless cabinets and you planned on saving the rest of the kitchen, and you also want a quick solution for refreshing your space, re-facing may be exactly what you’re looking for. Having an expert come out to meet with you and discuss your options is always the best way for you to make a well informed decision on how to move forward.